Today I’m starting a new feature on the WC Blog in which I will feature a different local restaurant or food establishment each week on Friday, in no particular order, other than where my stomach leads. I’m calling it Friday Food. Not that clever, I know, but I’m a fan of alliteration, and I’m sticking with it! 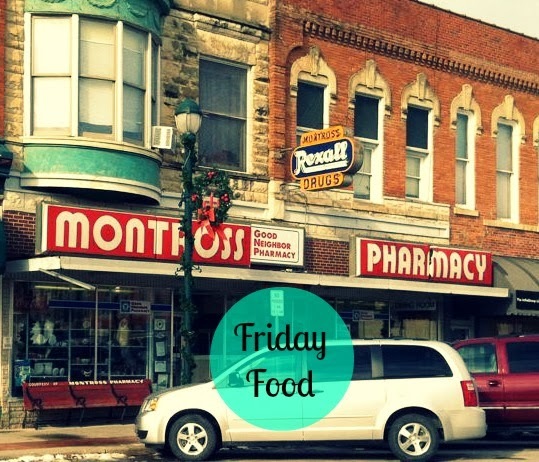 So, with no further ado, the inaugural edition of the Friday Food shout-out series goes to the coffee shop at Montross Pharmacy, which has been serving customers in Winterset for a very, VERY long time. I don’t know exactly how long it has been in existence, but I do know this: One day in the mid 1950s, when my grandpa Gene Trask was looking for a place to open a jewelry shop, he drove the family to Winterset from their home in Mt Ayr and spent some time here trying to secure an open storefront located on the southeast corner, by Ben Franklin, while the rest of the family went off to explore their potential new hometown. At some point that day, my dad, age 10, and my grandma Evelyn realized that my aunt Nancy, age 7, had wandered off and was nowhere to be found. Panic-stricken, they called the police, which were then located in the building that is now Shahan-Walsh Accounting. The police said not to worry, because they had just received a call from Montross Pharmacy to report a lost little girl. They hustled over to find her, and there she was, happily sitting at the counter and sipping a root beer, on the house. I’m pretty sure it’s the first place I ever went by myself, without parents, to order food or drink of any kind. It was all the rage in junior high to meet there for a cherry coke after school, with fries if we could pool enough money, or one of their incredible cinnamon rolls. My old friend Jeff Olson, who used to be just one of the kids eating fries with the rest of us, is now the manager of the place and just won the Business Person of the Year award at the chamber banquet on January 30th. I guess time marches on! Today, Montross’s has a great “$5.00 After 5:00” special: your choice of a cheeseburger, 3-piece chicken strips, or chili-cheese dog, served with fries, a drink, AND a sundae. They also have nightly specials throughout the week: lasagna and salad on Monday, tacos on Tuesday, build-your-own-burger on Wednesday, BLTs on Thursday, and fish on Friday. If you haven’t been there in awhile, stop in soon and take a walk down memory lane, or discover something you didn’t know they had. The Montross Coffee Shop is a Winterset classic.